Did you know that one Edinburgh tram equals the weight of nine African Elephants? No, well you do now! 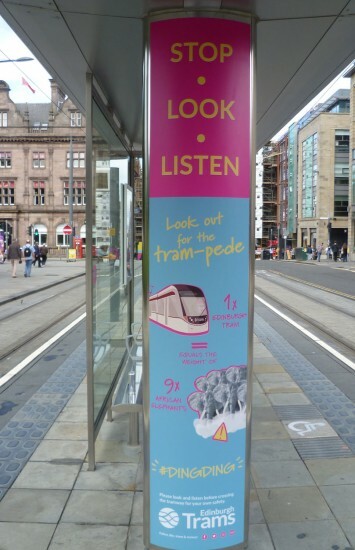 As part of a new safety campaign in the Scottish capital pedestrians are being encouraged to “Look out for the tram-pede” with posters being added to tram stops. The campaign is looking to make people aware of trams running through the streets of Edinburgh and just reminding people that a single tram is very heavy and if it hits you is likely to be quite painful. Edinburgh is just the latest UK tramway to start a campaign like this with more and more people seemingly oblivious to their surroundings.